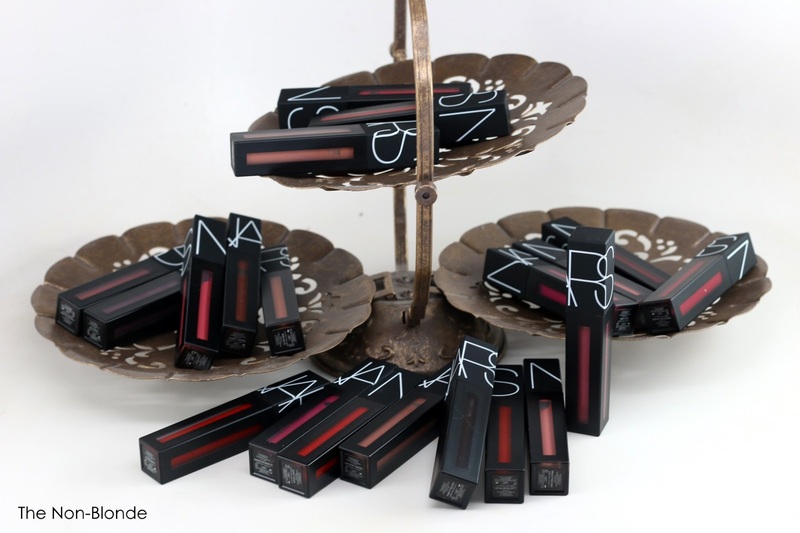 There are many NARS posts in our immediate future because I've been sitting on a growing pile of products taking my sweet time testing some. I also had to reassemble and rearrange my photography setup ever since the guest bedroom which was where I used to do the work has become a kitten nursery. I can't say what took me so long and why I haven't thought of the brilliant idea of doing my blogging and photographing in my play room, which is where my makeup lives. Go figure. Now everything is in one place and there are fewer lip products moving around the house (not counting anything the cats have stolen and hid in their stash of milk caps, lonesome socks, pens, and tiny vials of perfume samples). 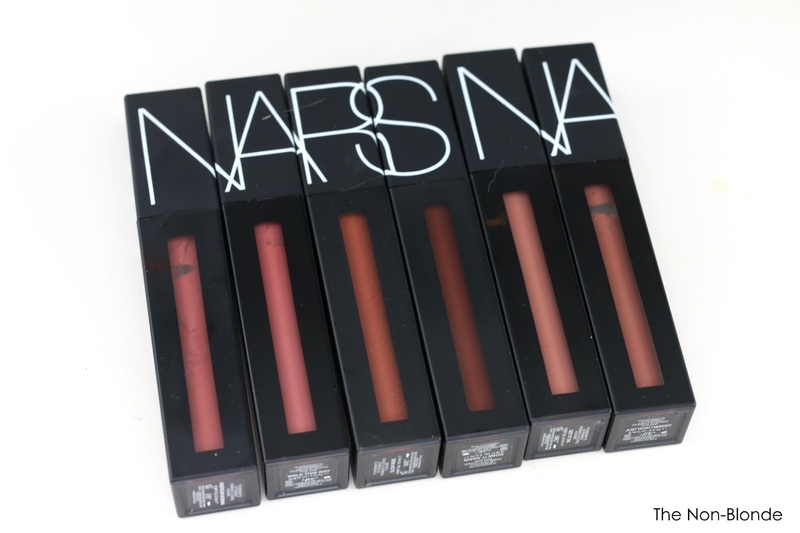 In any case, this is not an all NARS all the time blog and I promise to talk about other things as well. But let's begin with the stuff that's been sitting here for the last four months or so, NARS Powermatte Lip Pigment. My opinion over the last twenty years has always been that NARS haven't gotten their lip game perfectly. Their colors were among the most beautiful on the market but they were flawed. Gipsy was my perfect lipstick and I've repurchased it at least three times. However, the formula made my lips crack and the lipsticks always went rancid before I completely used them up (those were the days that using up a product wasn't accompanied by a fireworks show and an announcement on social media). was obviously a glutton for punishment, and Gipsy was so gorgeous. Eventually I stopped the self-punishment and moved on. 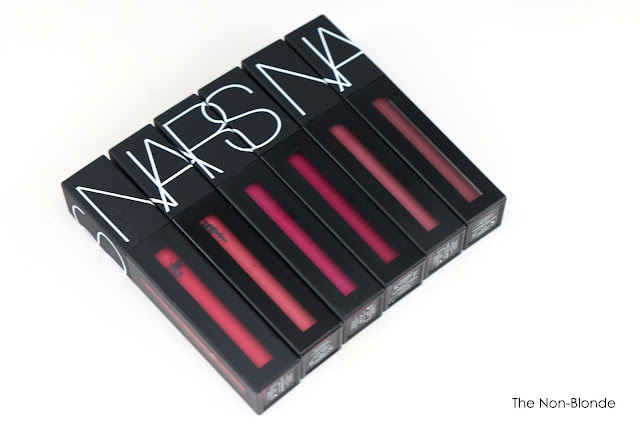 My favorite lip gloss was also NARS. Gothika, if I remember correctly. The formula was excellent for the time and the color, again, was brilliant. It was the way the familiar slightly chemical smell of NARS product that started going stale and rancid mid-tube that used to drive me crazy. But what was the alternative? Lancome's Juicy Tubes? 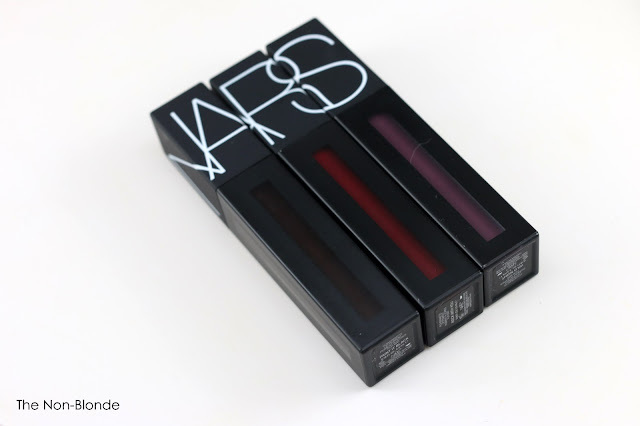 My point is that NARS has been trying and trying hard to improve. 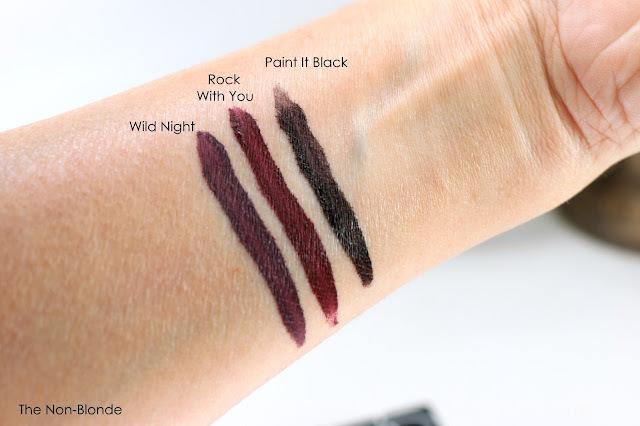 There were a number of limited edition formulas that didn't make it into the permanent line, innovative chubby sticks in more divine colors (and horrid smell that doesn't stop me from using up and repurchasing Rikugien and Cruella), and sometimes a sensational formula like their Audacious lipsticks. It's the liquid stuff where they most often stumble. Last year's release (permanent) was the Velvet Lip Glide, while now we have the Powematte Lip Pigment which took me forever to decide if I love them or hate them. 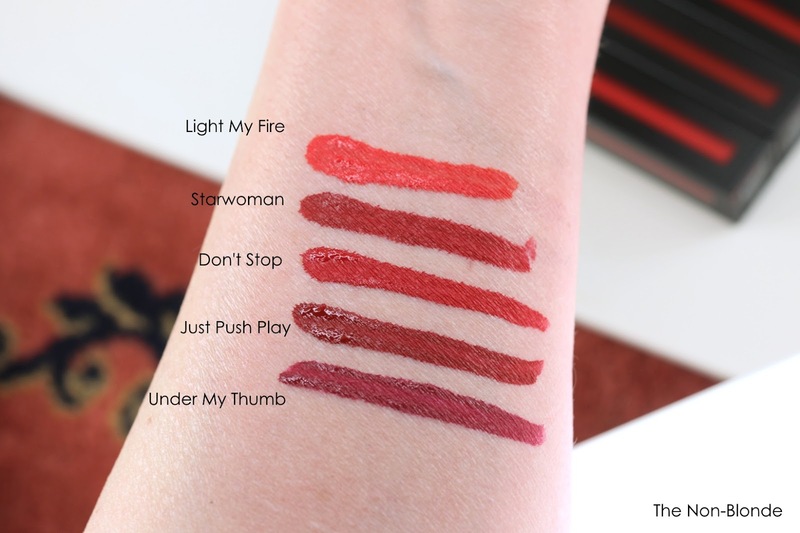 The Powermattes were obviously formulated to be more matte and pretty much along the lines of the modern liquid lipsticks. I'm not sure it works quite this way. Once again you need an unbelievable small amount of product for a sane and sustainable application. The redesigned wand is narrow and more precise, so in theory you can outline your lips perfectly. However, due to the goopiness by the time your cupid's bow is all ready to go the rest of your mouth has gone vampire after a snack. 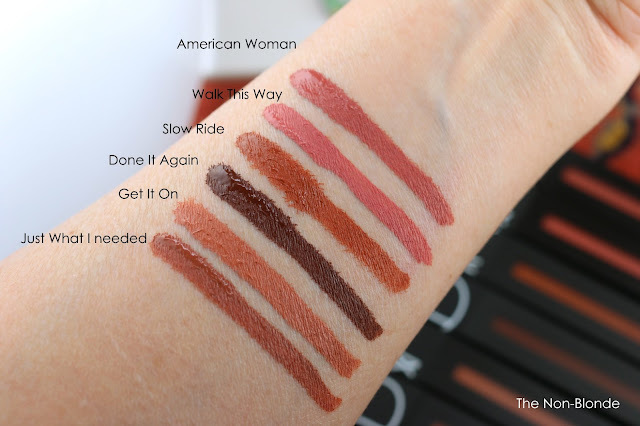 The lipstick takes a few seconds to dry (and much longer if you've been over-applying, as you can see in some of my swatches), and in the meantime it slides around feeling oddly oily on the lips. I haven't tried Lancome's Matte Shakers (the Juicy Shakers made me almost give up on the brand), but my friend Josie says the feeling is eerily similar. So here's what I have to say after wearing several of these NARS Powermatte Lip Pigments for a few months (more than half of them are in the process of being rehomed): Start with a lip liner, matching or clear. It's non-negotiable as you can see in the watches that these colors bleed. Take me seriously about the tiny amount to use and apply it with a brush. Carefully. Don't touch anything until you're sure the color is dry enough (it will still transfer). Since the ones I've kept are mostly the red ones, any wrong move has resulted in a crime scene situation. It's a power pigment, alright. Dark colors will stain. Your lips, hands, pets. It requires a serious oil (I use camelia) to fully remove. Cats would prefer oil from a tuna can. Now to the colors themselves. I've grouped them according to what made sense during the second and a half before Georgie (that's a cat, if you're new around here) tried to take off with the disposable applicators, clean and dripping with color, I used for swatching (see: rehoming). I'm sure you get the picture. Paint It Black- A blackened purple or an inky brown purple. Rock With You- Slightly charred beetroot. Wears beautifully. Wild Night- I think Nick Rhodes had this in the 80s. A very dark red-based purple. Light My Fire- A predictably orange red. Don't Stop- A very classic movie star red. Just Push Play- Kind of a (fresh) blood red, very close to Starwoman. Under My Thumb- A berry red. American Woman- This is the only one from this group I can wear. It's a warm dusty rose that leans beige. Walk This Way- A slightly brighter and peachier version of the above. Slow Ride- There's a stage in making caramel for toffee that looks like this. Done It Again- This one actually belongs with the darkest group. Pure chocolate. Get It On- J.Lo beige. Just What I Needed- A darker and more red toffee, or a pink-based brick. Get Up Stand Up- A Betty Draper kind of retro coral-pink. Low Rider- Another reto, this one from the 80s. I had a shirt this color. Give it Up- Pink Fuschia. Save the Queen- A muted mauve (or is mauve always muted? In any case, please please please save the Queen). London Calling- A corpsy purple, and I mean it in the best possible way. Bottom Line: NARS wins at colors, and I was particularly happy to see such a wide range that's more inclusive than most. If you see the color of your dreams the hassle of application is worth it. Otherwise, buy an Audacious lipstick. NARS Powermatte Lip Pigment ($26 each) are available at the usual suspects: department stores, Sephora, and online. The entire set of colors was sent to me by the company's PR. Thanks for the review. So many liquid lip options out there at the moment. I've been trying a lot of them lately. I don't mind Huda liquid mattes. 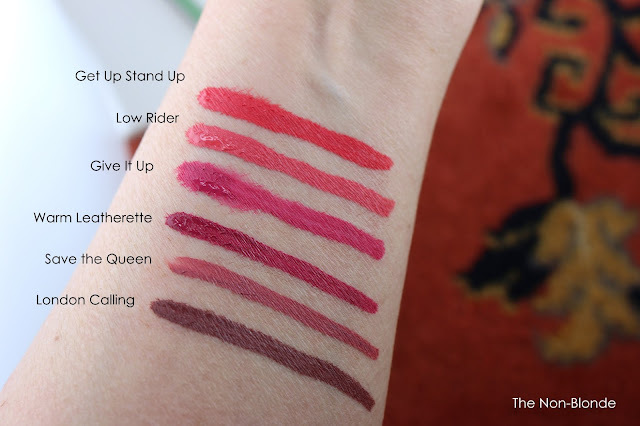 Favourite is Beauty Bakery Lip Whip. Thanks and great review! 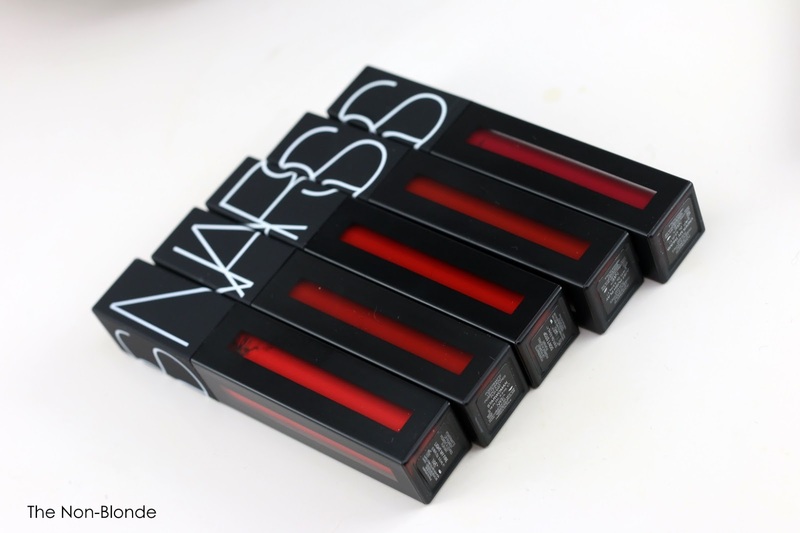 I have so many NARS products but their lipsticks have always been a fail, for exactly the reasons you mentioned. Perhaps this new line will bring me back - Light My Fire, Warm Leatherette and Don't Stop are at the top of the 'must try' list. I have 4 of these and they have a learning curve to apply most definitely - I am still practicing not making a mess. Glad you pointed out that they feather because I thought it was just me making a mess. lol I do love the colors (2 reds, 2 pinks/roses) I have so I'll just stick with them and call it a day. When I'm frustrated I'll just put on Charlotte audacious lipstick and be done with it.